This report is based on 12 samples of frozen and fresh fish samples sent to us by Barnet L. Liberman of TruFresh, LLC, 421 Hudson Street, New York, NY, 10014. The samples arrived in good condition. Eight of the samples were received in the frozen state and four samples were labeled fresh, not frozen. The samples were numbered 1, 2, 3, 4, 5, 6, 7, 8, 11, 12, 13 and 14. The samples corresponded to four distinct species, tuna, salmon, salmon roe and sturgeon roe. Each of the species was either unfrozen (fresh), prepared by conventional freezing methods or the TRUFRESH® freezing method. The purpose of this examination was to evaluate by comparison the freezing artifact left by the TRUFRESH® Method and conventional freezing to the fresh samples. Appearance and texture of raw fish muscle and other seafood products is an important index of freshness. Fish muscle firmness, however, decreases rapidly after death during chilled storage. Because softening of muscle results in deterioration in quality, understanding the muscle softening mechanism and developing a method for preventing softening are important for fisheries. In this regard, TRUFRESH® LLC. has developed a rapid freezing method to help preserve the fish. Typically the concept is to freeze the specimen as rapidly as possible so that ice crystal damage is minimal, and to as low a temperature as practical, to avoid the possibility of sublimation. Indeed a range of specialized freezing techniques has been developed for fast freezing of fish and roe. Light and scanning electron microscopy techniques can be used to evaluate the ultrastructural changes that contribute to the overall appearance and texture of the frozen products. Conventional preparation techniques for Scanning Electron Microscopy (SEM) necessarily involve dehydration, which in turn, usually necessitates a prior chemical treatment know as fixation. The main advantage of low temperature or “cryo” methods is that it offers the opportunity of observation and microanalysis of biological specimens under conditions that are closely related to the natural state. By using a cryostage attached to the SEM, we can examine samples that have been rapidly frozen and viewed in a state more closely approximating that seen in the native state. These samples are free of chemical fixation artifacts and, since they are viewed by utilizing the contrast provided by examining them in the water window, do not require chemical enhancement agent. Cryo SEM permits a frozen sample to be maintained in its frozen state, minimizing the artifacts of conventional chemical fixation, dehydration and critical point drying of the sample prior to viewing. The frozen samples can be handled to minimize or avoid the artifacts caused by traditional chemical fixation. This in turn leads to excellent microscopic information provided that the ice crystal sizes in the sample are sufficiently small such that ice damage has not occurred. In food science, freezing has long been used for food storage. The size and location of ice crystals and the damage they cause can affect the overall quality of stored food. In these applications, freezing is used to maintain morphological and histological structure and appropriate texture and taste and to reduce or eliminate spoiling. In both cryofixation and food storage, the location and amount of ice formed in the tissue are critical; if ice crystals are permitted to form they can cause significant tissue damage ranging from loss of nutrient value to relatively large-scale tissue damage. In this regard, samples of frozen (8 samples) and fresh (4 samples) fish and fish roe were sent to the Imaging Center to be imaged by cryo electron microscopy (see table1). Upon arrival, the frozen samples were immediately placed in a –80oC freezer where they where stored until imaging. The results of the fresh samples are not included in the results. In order to image them by the comparable cryo SEM technique, we would need to rapidly freeze them by plunge freezing in liquid nitrogen under vacuum. This would add another variable in the freezing processes that, in my opinion, would not be a valid comparison to the other procedures. Various freezing methods can have differing outcomes that can produce freezing artifacts or damage. During the freezing of tissues, ice forms first in the continuous extracellular compartment of the tissue. This ice formation changes the chemical activity of that compartment through rejection of solutes from the growing ice crystals and a resulting increase in the salinity of the remaining unfrozen fraction, which in turn leads to chemical disequilibrium between the inside and the outside of the cells. If the freezing rate is too slow, the system will attempt to reach chemical equilibrium by transporting water across a barrier (the cell, basement, and/or capillary membrane) until the intracellular solute concentration balances that in the extracellular compartment. This phenomenon is easily visualized microscopically as cellular dehydration (shrinkage). There are several morphological clues of this freezing artifact including: cracks in the tissue, enlarged intra and extracellular spaces, ice crystal damage and cell lysis. As ice crystals form, they can poke holes and rupture cell membranes leading to loss of tissue integrity. This is often observed as cracks in the tissue or enlarged spaces in the tissue or between cells. This slow freezing often results in the appearance of salt crystals and other precipitates on the surface of the tissue due to the rupture of the cell membranes and leakage of its constituents. If, on the other hand, the freezing rate is fast enough, water will become kinetically trapped in the intracellular compartment. In this case, the system finds equilibrium through a state change of the cell cytoplasm from liquid to solid, without forming crystalline ice. Often, the rate of freezing of the sample is such that both cellular dehydration and intracellular ice formation will compete to determine the final proportions of water (ice) in the cellular and extracellular compartments of tissue. This leads to minimal ice crystal formation and optimum structural integrity and preservation. In this study, the fish and the roe samples prepared by the conventional freezing method demonstrated numerous freeze artifacts including dehydration (shrinkage), cracking between tissues and cells, cell lysis and formation of salt crystals and precipitates on the exposed surfaces of the tissue. The samples prepared by the TRUFRESH® method consistently demonstrated optimal structural integrity and preservation and did not show signs of significant freeze artifact when compared to the convention freezing method. Muscle cubes (5 mm • 5 mm • 5 mm) were excised from the tuna samples (Samples 1 and 2) by a razor blade and allowed to thaw for 3 hours at 4 degrees C. The samples were fixed by immersion in 2% glutaraldehyde in 0.1 M phosphate buffer (pH 7.4) and fixed. The fixed samples were dehydrated by ethanol series (50–100%, 30 m each) followed by paraffin embedding. Paraffin sections were prepared by a microtome. Preparations were viewed using a Nikon Eclipse E800 photomicroscope equipped with brightfield, DIC, phase and fluorescence optics. The samples were viewed using a 4X, 0.13 n.a. plan fluor objective. Digital images were collected using a CoolCam liquid-cooled, three-chip color CCD camera (Cool Camera Company, Decatur, GA 30033) and captured to a Pentium II 300 MHz personal computer using Image Pro Plus version 4.1 software (Media Cybernetics, Silver Springs, MD 20910). Digital images were stored for future printing and analysis using ImagePro Plus. Preparations were viewed using a Hitachi S-3500N scanning electron microscope (Hitachi Instruments, San Jose, CA) at 5 keV. The instrument is equipped with an Emitech K1150 cryogenic preparation system. The samples were cut with a cold razor blade into pieces approximately 3mm2 and mounted on the specimen mount (8mm x 12mm of the transfer device. The frozen sample, mounted on the stub, is transferred into the freezing chamber. This is used to contain boiling liquid nitrogen (LN2, -210oC. The transfer device is fitted to freezing chamber port, and, using the transfer rod, the specimen stub (bearing the sample) is plunged into the cryogenic liquid. When the sample is cooled (boiling stops), the stub shroud is closed and the stub is withdrawn into the transfer device chamber which is immediately evacuated. The transfer device is inserted into the preparation chamber housing which contains a coldstage. During operation, this chamber is held under vacuum and the temperature of the stage is held at better than -160oC. Typically transfer of the specimen from the freezing chamber to the preparation chamber takes less than 90 seconds, during which there is minimal specimen temperature rise (+8oC). Once fitted to the preparation stage, the stub temperature is held to that of the stage. The samples are coated using the Sputter Coating stage with ultra low thermal input, high resolution (magnetic deflection) sputtering. (Less than 15oC temperature rise during sputtering for 4 minutes). The sample is then transferred to the coldstage in the SEM specimen chamber and viewed and photographs were digitally recorded. Pieces of fish muscle (5 mm • 5 mm • 5 mm) were removed from the frozen tuna samples (Samples 1 and 2) by a razor blade and allowed to thaw for 3 hours at 4 degrees C. The samples were fixed followed by paraffin embedding and sectioning. The results show that the pericellular space between the muscle fibers is obvious in the sample frozen by conventional methods. The spaces ranged from 2-18 microns in size and these spaces appeared to be consistent through out the sample. In the tuna prepared by the TRUFRESH® method the pericelluar spaces are reduced and the muscle fibers appear more densely packed. The pericellular spaces ranged from 1-6 microns. This reduced spacing as compared to the sample frozen by a conventional method appeared uniform through the entire thickness of the sample. The distance between muscle fibers is larger in the conventionally frozen tuna than the TRUFRESH® method. This result typically indicates that the mechanical strength of pericellular connective tissue became relatively weak and larger space was made by tissue degradation due to freeze artifact. If the freezing rate is too slow, the system will transport water across a barrier (the cell membrane) until the intracellular solute concentration balances that of the extracellular compartment. This is easily visualized microscopically as cellular dehydration (shrinkage). The TRUFRESH® method (B) demonstrates no indication of freeze artifact at the resolution of the light microscope (x230). Preparations were viewed using a Hitachi S-3500N scanning electron microscope equipped with an Emitech K1150 cryogenic preparation system. The samples were cut with a cold razor blade into pieces small enough to fit onto the specimen mount. The frozen sample, mounted on the stub, is transferred into the freezing chamber to further cool the sample. The sample is then transferred to the microscope specimen chamber. During operation, this chamber is held under vacuum and the temperature of the stage is held at better than -160oC. Typically transfer of the specimen from the freezing chamber to the preparation chamber takes less than 90 seconds, during which there is minimal specimen temperature rise (+8oC). Once fitted to the preparation stage, the stub temperature is held to that of the stage. The sample was then transferred to the coldstage in the SEM specimen chamber and viewed and images digitally recorded at the desired magnification. Fig 2. Example I. Comparison of tuna muscle (Samples 1 and 2) by frozen hydrated cryo-scanning electron microscopy. (A) Conventional and (B) TRUFRESH® freezing methods. Muscle fibers are running longitudinally. Conventionally frozen sample has cracks (black arrow) and enlarged intracellular spaces (white arrow). Also note the crystalline debris on the surface of the sample due to the leakage of salts from inside the freeze damaged cells. Note the smooth surfaces and absence of gaps between muscle fibers and lack of cell lysate on the surfaces of the TRUFRESH® method (B) indicating excellent preservation. Scale bar is 100 microns. Fig 3. Example II. Comparison of tuna muscle (Samples 1 and 2) by frozen hydrated cryo-scanning electron microscopy. Fig 6. Comparison of salmon muscle (Samples 3 and 4) by frozen hydrated cryo-scanning electron microscopy. (A) Conventional and (B) TRUFRESH® freezing methods. Muscle fibers are running longitudinally. In (A) note the large gaps in pericellular regions (white arrow) and crack (black arrow) in the tissue. Also note the significant amount of crystalline debris on the surface of the sample due to the leakage of salts from the freeze damaged cells. 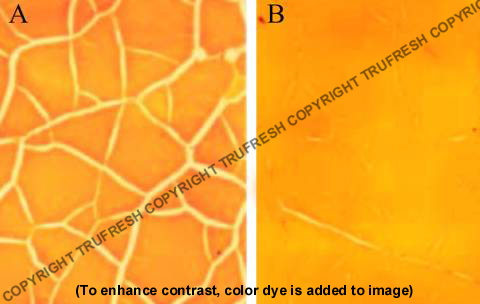 Note the smooth, natural appearing texture, the absence of gaps between muscle fibers and cell lysates on the surfaces of the TRUFRESH® method (B) indicating excellent preservation. Scale bar is 100 microns. Fig 6. Comparison of salmon roe (Samples 5 and 6) by frozen hydrated cryo scanning electron microscopy. (A) Conventional and (B) TRUFRESH® freezing methods. This is the outer surface of the frozen roe. The major round features are cortical granules on the chorion envelope. Cortical granules are secretory vesicles in the cortex under the plasma membrane of animal eggs, whose contents are released during fertilization and fuse with the cell membrane at a particular time after fertilization. Conventional freezing (A) has caused shrinkage (dehydration) artifacts as can be seen in the crater-like appearance of the granules and cracking on the surface (black arrows). Note the smooth surface and minimal cracking in B indicating excellent structural preservation. Scale bar is 20 microns. Fig 7. Comparison of salmon roe (Samples 5 and 6) by frozen hydrated cryo-scanning electron microscopy. (A) Conventional and (B) TRUFRESH® freezing methods. This is the outer surface of the frozen roe. The major round features are cortical granules on the chorion envelope. Conventional freezing has caused shrinkage (dehydration) artifacts as can be seen in the crater-like appearance of the granules and cracking on the surface. Note the naturally appearing smooth surface and minimal cracking in B indicating excellent ultrastructural preservation. Scale bar is 100 micron. Fig 7. Comparison of sturgeon caviar (Samples 7 and 8) by frozen hydrated cryo-scanning electron microscopy. (A) Conventional and (B) TRUFRESH® freezing methods. This is a fractured interior surface of the frozen sturgeon roe. Note the cracks between layers of the cortical region (black arrow) and the crystalline debris due to poor freezing. Note the minimal cracking between chorion membrane (arrow) and cortical regions in B indicating excellent preservation. Scale bar is 20 microns. Fig 8. Comparison sturgeon caviar (Samples 7 and 8)by frozen hydrated cryo-scanning electron microscopy. (A) Conventional and (B) TRUFRESH® freezing methods. This is the outer surface of the frozen roe. The major round features in (A) are cortical granules on or near the chorion envelope. Note the cracking (black arrows) and uneven surface in A due to shrinkage during the freezing process. Note the smooth surface and minimal cracking in B indicating excellent structural preservation. Scale bar is 20 microns. The results of the light microscopy and cryo scanning electron microscopy clearly demonstrate excellent structural preservation of fish and fish eggs following freezing by the TRUFRESH® method. There is little to no indication of freeze damage artifacts in any of the tuna and salmon muscle or salmon roe and sturgeon caviar when observed by light and cryo-scanning electron microscopes. This method of freezing has maintained a level of ultrastructural preservation that is typical of highly rigorous and specialized methods of cryo preparation such and high pressure freezing and propane-jet freezing techniques. Those techniques, while giving excellent ultrastructural preservation, do not lend themselves to the freezing of “bulk” samples such has seen here. Because appearance and texture of raw fish muscle and other seafood products is an important index of freshness, it is likely that the process will be successful in preserving other aspects of the edible qualities of the product. Please do not hesitate to contact me if additional information is needed.